Who knew that packaging could be so exciting? We’re delighted with the way PI Global has taken our ideas and made them into a functional reality. In fact, there is a chance that our original innovation, that has captured everyone’s imagination – the piggy-backing of simple medicines on the Coca-Cola secondary distribution system – may be over-shadowed by the innovations we’ve packed into the design of the latest AidPods. 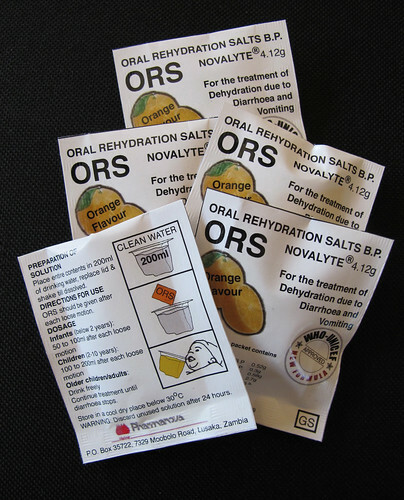 We are moving away from including 2 x 20g sachets of ORS which make up 1 litre of solution each; why not pack in 8 x 4g sachets that each make up 200ml? This gives a one-to-one relationship between the measure and the sachet. There will be far less wastage, and less potential for mistakes when mixing or contamination. This stemmed from the discussion here. The AidPod will have a lid and so can be used as the mixing device – no need for a potentially dirty stirring implement – just put the lid on and shake. 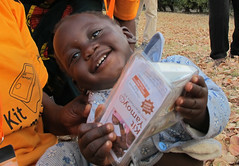 The sick child may be fed directly from the AidPod. 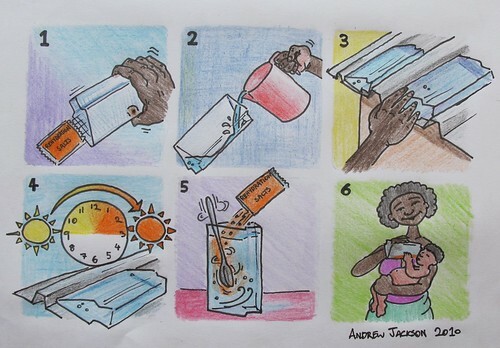 We also believe the AidPod has the potential to act as a SODIS device to sterilise the water – this aspect will not be a part of the current trial but in parallel with the trial we will testing this aspect of the AidPod design. 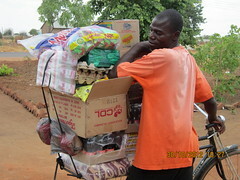 As it is made of plastic, we have always wanted to promote other re-use potential. People have told us that they would never throw the container away as it looks so useful. We’ll see. Once again, we’d like to thank our packaging partner, PI Global, for helping make our ideas work in the real world, and to Pharmanova for their work preparing to produce the 4g sachets for us and preparing the ground to the application for approval the PRA (Pharmaceutical Regulatory Authority). And finally, here’s an early artist’s impression of how the AidPod might be used as a SODIS device. The artist in question is Andrew Jackson. This is great news – adequate size, easy dosing and mixing, no changing of recipients – and SODIS-enabled. Impressive indeed! This has a nice look and clear, clean directions! 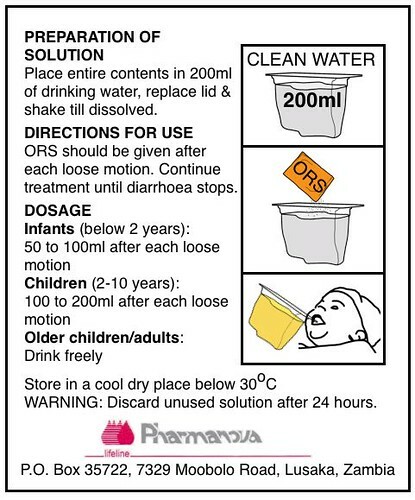 Our rice-based ORS, CeraLyte, also comes in a pkg to mix into 200 ml OR one that makes 1 liter, as the 1 liter size is needed for cholera while the smaller size is useful for most other diarrhea.